Last Sunday I bought package of beautiful super white beef tripe already blanched and cut into strips so I had to make a decision as to how I will cook them: as usual in a soup (my favorite) or do I try Italian, French or Chinese recipe. 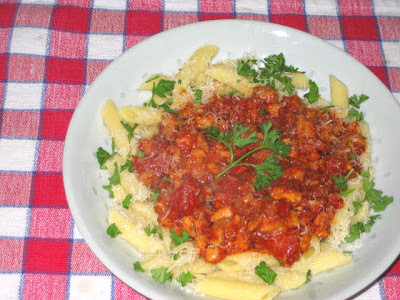 Since I wanted my wife to finally try and taste tripe dish I have decided on Roman style where the tripe almost disappears because they are chopped into small pieces and blended with thick tomato sauce. Did she eat it? Yes, and not only that, she wants me to make it again. She really liked it but she would have preferred not to know what she was eating. North Americans have this mental block when it comes to offal, I guess. This dish is very easy to make but it does take time. 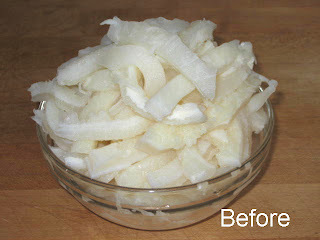 One note to anybody that never cooked tripe before: the tripe shrinks a lot when it is cooked or boiled. See the pictures of before and after boiling. My guess is that volume of cooked tripe is less then half of fresh ones. 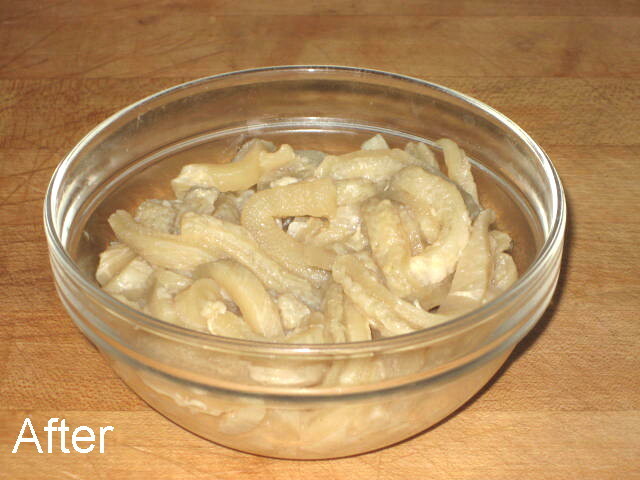 You have three options to cook the tripe: on the stove in regular pot, slow cooker or pressure cooker. In all cases use salted water and small muslin bag or tee egg with bay leaves, allspice and cloves. On stove top bring to boil, lower the heat and simmer for 2-1/2 hours. Slow cooker low 6 hours and pressure cooker 1 hour. When soft, let cool so you can handle the tripe and chop into pieces about the size of dime and reserve. In a frying pan or sauce pan heat olive oil and sauté garlic and rosemary till fragrant. Pour in Marsala and reduce to 1 Tbs. Add tomatoes and chopped tripe and simmer for 45 minutes. 10 minutes before serving add balsamic vinegar and parsley and mix till well combined. Cook penne in salted water till al dente, strain and place on individual preheated serving plates. Pour sauce over pasta, sprinkle with cheese and serve. I really tried that, although I was very anxious about this dish. It was quite delicious, I would have prefered not to know that there was tripe in that meal. It was very interesting and I do believe that I would most likely eat it again, especially with homemade pasta. 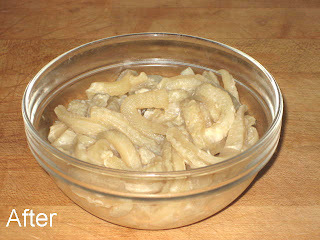 Yeah tripe isn't something we eat a lot of, but it would be worth making this recipe to try it.